Pumpkin Gutter - Page 7 - Zombie Pumpkins! I put a movie of this working in this years gallery on my website...have a peek...there is sound. (called it "gutting made easy")...from last year. Tried out my Pumpkin gutter! I was very surprised how FAST you can gut a pumpkin! I think it didn't take me no more than 5 mins to clean it out very nicely. Did I mention I felt like an evil neurosurgeon partaking in my science experiments?! Muhahaha! All that power! Now.. I just need a lighter drill to use, the one I got is a bit heavy...o well! I'm very happy I got this tool, very ESSENTIAL for your Ultimate pumpkin carving toolset! IMHO a corded drill with 2 hand operation is better (the grab handle for when you need to go 1 handed, far easier than a battery drill & the power is there all the time. Happy Halloween to all, and thanks Ryan for all you do with this site. 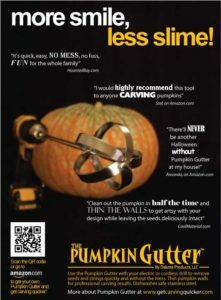 Thanks in part to all of you, there were more Pumpkin Gutters sold this year than any year previous. I hope by making gutting easier, more people will carve. This forum has been a great source of information and feedback for me, thanks to all who have contributed. It's hard to describe the feeling of seeing a forum about my product with over 45,000 views. GG, what about expansion? & do you hold any other products under your belt? It actually makes me mad (wife & I were talking last night whilst clearing up) why the heck pumpkin carving is not taught as part of art & craft at school, complete with toasting seeds & using the veg as part of seasonal food! Thanks to Ryan, Stoney, JP & the like making such a neat job for us to take the credit for, we thought that if schools taught kids in groups to do a craft casrving (no nothing that could inflame twattish idiots out to use religion / supernatural influence blah blah, then the next generation of adults would feel good to carve & share projects / fun time with their offspring rather than simply placating them by buying them a damn mask as the full extent of something like trick or treating. I can vouch safe for the joy my daughter & others feel displaying a good pumpkin by their own hand, your gutter has made what can be a messy chore into a superb fun family project, my six year old holds the kins whilst I gut, she's taught responsibility which is why I allow her to get so close to a working power tool.. If schools participated by means of co-ordinated sessions for kids then adults & kids together, using a pumpkin gutter & saral paper I doubt there would be many unlit houses given the opportunity to show off carving talent worked with hands & basic tools. I hold my childs carving hand all the way through a kin to ascertain blade movement & pressure applied, other than that the results are all her own, you could say i'm her voice coach! I hated the rigmarole of pumpkin gutting, however since purchasing your product it's meant we can get carving within 2 minutes of cutting a lid.. perfect for even the most time pressed parents. couldn't be without it, If I were "somebody" i'd heartily endorse this product! If I were you regards the uk, i'd have a look at bigbarn.co.uk & add up the pumpkin growers, farmers here are cautious types however may see the benefits of selling your gutter alongside their fruits..
small packages of 10 gutters to a farm shop maybe to test the water & get the product seen by general adults not just pumpkin fanatics in the know. Well said, Gus, and thanks for the positive feedback! It's great to hear about parents that spend time working with and teaching their children as you do. I don't currently have other Halloween products out there. I do own a product development company called Innovative Solutions (innovativesolutions-llc.com) that works on projects for companies and individuals (the Pumpkin Gutter happens to be my own invention). We have full engineering and prototyping facilities including a full CNC machine, welding, plastics, and composites shop. I am always looking for ideas or suggestions about products that could be created/improved or problems that need to be solved. I would welcome any ideas on this forum, keeping in mind that the they probably have to appeal to a large audience to justify the development and marketing cost. Thank you for the bigbarn tip, I will attempt to make contact with them. Some kind of skill saw would be great not one of those cheap ones at the store but one that is actually useable. Hello fellow pumpkin gutters! Just a heads-up that we are working on a shorter version of the instructional video on YouTube at http://www.youtube.com/watch?v=rdLD15-JL5I. It should be posted in the next week or two. You'll see from some of the other videos on the channel that we've had fun with the Gutter throughout the year! Happy Gutting! GutterGuy, That instructional video of yours is helpful, I've sent many people to that YouTube link. I look forward to seeing what other video(s) you release. Gutters at Wal-Mart? Interesting. Any truth to this, GutterGuy? Or Jimm, you could provide us with further reconnaissance. Yes, it's true. I have a licensing agreement with a company that has relationships with large retail and they were able to get Walmart to try Pumpkin Gutters this season. I hope they do well, and I hope that they encourage many more people to carve pumpkins. Our licensing partner is very cool about us continuing to work with pumpkin patches and partners like Zombie Pumpkins. Edmund Scientifics will also have Pumpkin Gutters in their regular catalog and featured in their Extreme Geek catalog in a couple weeks. 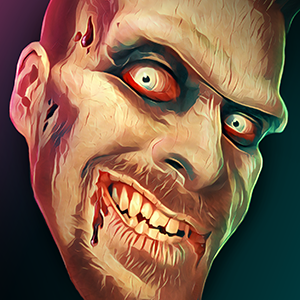 I'm so grateful to Zombie Pumpkins and its large group of active users who have been, and continue to be, a large part of the Pumpkin Gutter story. Patchmaster, thanks for referring people to the video, I'll let you know when more are available. Happy Gutting! Ah, that's great news. It's so fun to see cool pumpkin/Halloween products grow as the years go by. I can remember when the Gutter was new on the scene, and now... how far it's come. Continued success. I saw Pumpkin Gutters at Wal-Mart just yesterday!!! There were only a few left. I just went to Walmart and bought one (I know, it's kinda corny ...we took some pictures in the store, too They are down to 5 left and, needless to say, my hometown market is already pretty saturated with Pumpkin Gutters! I'm glad they're official Pumpkin Gutters! I wanted to double check before buying one, but as long as they're legit I'm going to pick one up.